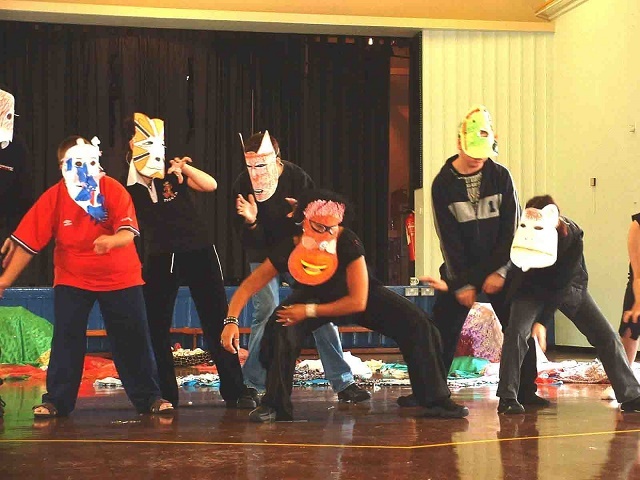 Performance by So Many Words, a UK arts organisation working with young people with learning disabilities using some of Boal’s techniques (Image: So Many Words). Augusto Boal is best known for Forum Theatre, in which members of the audience come on stage and rewrite plays. But Boal has also formulated or summarised a wide range of different techniques for revolutionising drama and life. In this essay, the fifth of the series on Boal, I will explain a number of different approaches, including the Joker System, Invisible Theatre, Image Theatre, and the use of bodywork and games. Boal’s approach is not a unitary system, but rather, consists of a range of techniques and devices which can be used in a variety of settings. The Joker system is used both in conventional plays and participatory methods as a way to disrupt fixed roles. The Joker – named after the card of the same name (and not implying humour) – can substitute for actors for purposes such as explanation and disruption, or to do magical things that other actors cannot. This is one of the earliest innovations Boal pioneered, dating back to the Arena Theatre phase, before the spect-actor had appeared. The system is designed to be flexible, so it can be adapted for different plays. The Joker has two main functions in a conventional play: Brechtian estrangement and intercontextual translation. In line with Brecht’s theory, the Joker system destroys the individual actor’s private ownership of a character. The Joker makes the act of authorial creation visible. S/he has a magical ability to summon walls, armies, and so on, which characters accept as real. The other main purpose of the Joker is to translate across contexts. It was also designed to deal with problems of cultural imitation in the South, by introducing a figure who could mediate local and foreign contexts. This system is also sometimes used when performing classical or historical plays out of context. For instance, in a Greek play, the Joker might explain the historical context to the audience, and why it is thought to be relevant today. The Joker technique is used on the assumption that a classic work is never self-evidently great or relevant; its relevance is investigated through performance. Bowman suggests that it involves “playing with”, rather than playing, a character. A text’s “otherness” becomes an opportunity for exploration, rather than a barrier or problem. She also suggests that, when used with students, it encourages reflexivity about social causality in their own psychological “character”. Performing a play out of context can be a way of finding human similarities or resonances. Boal suggests that this can be a way to challenge racism. The “Maniac” in Dario Fo’s Accidental Death of an Anarchist largely plays a Joker role. The term ‘Joker System’ is also used to refer to the eclectic shuffling or pastiche of styles and forms. In this context, the Joker as a performer has the role of holding together the different partially-used styles, providing a unified perspective. This is important to convey structural causality, rather than an incomprehensible world or fate. As well as time and space, the Joker can translate across genres or styles. Remember that in arena theatre, different scenes are often written in different styles (naturalistic, expressionistic, surrealistic, fantastic, etc), and events are often “translated” between different contexts (past and present, local and foreign). A major part of the Joker’s role is to bridge these differences. Interview – stopping the action so a character can explain their actions, in a similar way to interviews after sports events. This is done to show a character’s “inside”, or psychology. Exhortation – explicitly encouraging action on the theme of the show. In Boal’s wider work, when used with ‘Forum Theatre’ or ‘Rainbow of Desire’ for example, the Joker plays a role similar to a session organiser or facilitator. However, Boal prefers to say that the Joker is a “difficultator” – making things more complex, rather than easier (“facilitator” is related to “facile”). Facilitators and experienced practitioners of Theatre of the Oppressed and related methodologies are usually referred to as Jokers. In theory, the Joker has limited power. Boal insists that the joker decides nothing. The joker lays out the rules of the game, but the audience are free to change them. In practice, the effectiveness of Theatre of the Oppressed often depends on the extent to which Jokers avoid imposing their own perspectives. While Forum Theatre is the best-known form of Theatre of the Oppressed, Boal also includes several other varieties of performance under the label. For example, Image Theatre involves arranging participants in dramatic images. These are more like sculptures than plays. Usually, one participant moulds the others into a particular image. In some variants, they can then move around, altering the image, or someone else can mould it differently. This is used in Theatre of the Oppressed to show the need for change. Spect-actors confronted with an image of their situation might be asked to make changes. Or a real and ideal image might be counterposed. People could then suggest ways to get from the real to the ideal situation. It is a way of making thoughts or conceptions visible, instead of expressing them in words (which can have multiple meanings). This method is frequently used in the Rainbow of Desire approach. Invisible Theatre refers to the performance of theatrical scenes in public places, without announcing them as theatre. Spectators or spect-actors believe they are participating in a real discussion, argument, etc. In this case, theatre crosses over into public protest, or the creation of situations. a performance about sexual harassment on the Paris Metro (Underground), which juxtaposed different responses to similar molestations of women and men. a pregnancy-themed event on Stockholm ferries, where a woman demanded the same treatment as a pregnant royal. a performance focused on racial discrimination, where a white man demands a black woman give up their seat. This quickly expands into demands that non-Swedish Europeans, drunk people, unemployed people, and so on (all played by actors) give up their seats. a picnic in the middle of the road, based on a critique of car culture in Sweden. Actors tried to persuade the drivers caught in the resultant traffic jam to join them for the picnic. This performance was eventually suppressed by the police. Douglas Hundley suggests that Invisible Theatre is actually older than Boal. It can be traced back to the Living Newspapers approach used by the Federal Theatre Project (FTP) in 1930s America, and before this, to methods used by German Brechtians to evade political censorship. Similar forms of protest theatre were used in 1960s America. In one case, for instance, Vietnamese actors in traditional dress attended military band concerts. They took cover whenever a plane flew over, showing the festivals’ connections to war. Hundley suggests that Invisible Theatre is particularly effective when people are suffering a loss of earlier liberties. Approaches of this kind are widely used as part of a protest repertoire. Reverend Billy and the Church of Stop Shopping makes extensive use of this method. It also appears frequently in the political comedy of artists such as Michael Moore, Mark Thomas, and the Chasers. And it is closely related to a style of protest which similarly uses mimicry and simulation to create real situations or media events – for example, the Yes Men, the Billionaires for Bush, and the Serpica Naro fashion show protest. This is clearly an approach which straddles the boundary between rehearsal and resistance. Newspaper Theatre turns news stories into performances in a variety of ways. These include reading articles together, or rhythmically, or alongside related actions or missing data. The general function of these techniques is to ‘denaturalise’ news coverage or to connect it to what it left unsaid. In one technique, two contradictory or symptomatically revealing stories are read alongside one another, such as gourmet meals with malnutrition. In another, missing facts are added to “complete” a story. News can be combined with historical sources, to compare relationships, such as to liken the boss-worker relation to the master-slave relation. Or news can be combined with other performances, such as miming an action or singing a song – for instance, singing the national anthem while reciting news of poverty. Meanings can also be contested and redefined through the use of rhythm, repetition, cross-readings of different contexts, improvisation, and so on. Where repetition has desensitised people to the emotional impact of stories, they can be supplemented by concrete images or actions. The justification for this technique is that news is always somewhat fictional, or discursively constructed. Boal argues that newspaper theatre makes visible the use of fictive or fictional techniques in the production of news stories. It demystifies the media of its appearance of impartiality. In Categories of Popular Theatre, Boal suggests that the motivation for newspaper theatre is to counter the neutralising effect of newspaper coverage. By juxtaposing massacres in Vietnam with tabloid-style “human-interest”stories and sports news, newspapers make the massacres seem natural and acceptable, and the other items seem just as important. Newspaper Theatre teaches people to read newspapers in ways which counter these false appearances. It uses techniques of demystification and deconstruction of journalism, but can also be used with other texts. Similar techniques have been used with genres of popular fiction/documentary such as photo-romances. Participants rearrange the narratives, run the stories set in different situations (e.g. working-class versus upper-class families), and so on. Sometimes they act out the basics of the story before seeing the written version. When they encounter the written version, they are inoculated against its naturalisation. The idea of this exercise is to make people read texts more actively. Myth Theatre retells myths or narratives to reveal hidden truths. This can include exposing the subtext of a myth. Monsters and bogeymen might turn out to be capitalists or landlords for example. Myths and urban legends are taken to be mystifications of a hidden truth which can be revealed. Another activity, called “Rituals and Masks”, reshuffles the social positions of participants in social rituals. This, and some other techniques, use a “social mask” associating a character with a class or occupation. Characters are broken down into their social mask and rituals. Different masks or symbols can be combined to produce different versions of situations. A cop wears a top hat as an agent of capital; what happens if s/he puts on a worker’s hat instead? What effect does this have on the rituals and structures of the role? Analytical Theatre involves running through situations in which characters’ roles are represented by symbols (e.g. a badge for a cop, a top hat for a capitalist). The symbols are reshuffled to show how they affect the same situation differently. A cop-robber story for instance is varied by giving the robber a top hat, or a revolver, or a Masonic symbol. The point of this exercise is to show that some actions are caused by class, rather than psychology or human nature. In this method, symbols separate the protagonist into attributes. Analytical images show either submissive or subversive (resisting) aspects of a protagonist. The protagonist seeks to either intensify subversion or shake off submission. The driving idea, as so often in Boal’s work, is that breaking an oppression in theatre will inspire someone to also break the oppression in reality. Other techniques work with images of situations. Differences in images of the same situation often reveal social differences. For instance, participants usually model unemployment as a queue of sad people. In Denmark, they instead pictured the queueing people smiling and spreading pamphlets. Boal says that this is because unemployed people in Denmark get more money and engage in more social activities as a result. There are also social variants, in which participants add and subtract from the images of reality and of an ideal until it expresses a consensus. The games listed in Boal’s texts, such as Games for Actors and Non-Actors, are diverse. Exercises in bodywork are used to induce people to take bodily positions which they never take in their everyday lives. For instance, two participants might have to walk as a single person, walk as a four-legged monster or roll together as a wheel. These kinds of exercises work to relax or stimulate muscles which someone does not usually use, so as to reduce mechanisation. Other games are used to get people using their bodies for self-expression, or to restructure participants’ ways of being. One activity involves participants acting as moving parts in a machine. Participants form a single machine, and can be instructed to increase or reduce the rhythm. Others play with rituals and masks. Actors might play familiar roles (from a play, or from life) while taking on a different ‘mask’, or social role. For instance, they might play a worker with the personality of a boss, or vice-versa. Some draw attention to the habitual activities people do all the time – such as resisting gravity. Still others are trust exercises. Some methods use the sculpting of bodies into particular images, or mirroring others’ bodies. For instance, an image of happiness might be modelled, to show reality without oppression. An exercise known as “breaking repression” involves trying to recall a situation where one felt particularly repressed – particularly one where one submitted to repression and acted against one’s own desires. Sometimes some participants “sculpt” others into particular images or situations. Some are familiar playground or parlour games, such as “wink murder” and “Musical Chairs”. Some activities involve “translating” between different forms of expression – for instance, expressing words as movements. Others cut off a particular sense, such as sight, so as to enhance other senses. Or they carry out an entire dialogue through visual images or movement. Participants are encouraged to feel the emotion of the image, rather than turning it into words. Ways are found to disrupt conventional assumptions. For instance, people’s “cookies” (see part 2) might expect a wedding to involve a bride and groom. This can be disrupted by instead showing two brides or two grooms. Some techniques focus on combining or altering perspectives. Presenting lots of individual visions together gives a multiple view of a subject, which is the closest we can get to an objective view, or a social (rather than psychological) view. Boal also sees techniques as ways to get around resistances to theatre. Some exercises faced problems, for instance, because macho men are uncomfortable with bodily contact. Some groups also run up against the problem that people think they can’t do theatre. They work best when people forget they are doing theatre. Boal thinks that this is because people are used to thinking of theatre and performance as imitation or “let’s pretend” – which is usually what TV performances are. Once people see theatre as their own life, rather than a TV model such as soaps, the approach succeeds. For other essays in the series, visit the In Theory column page.